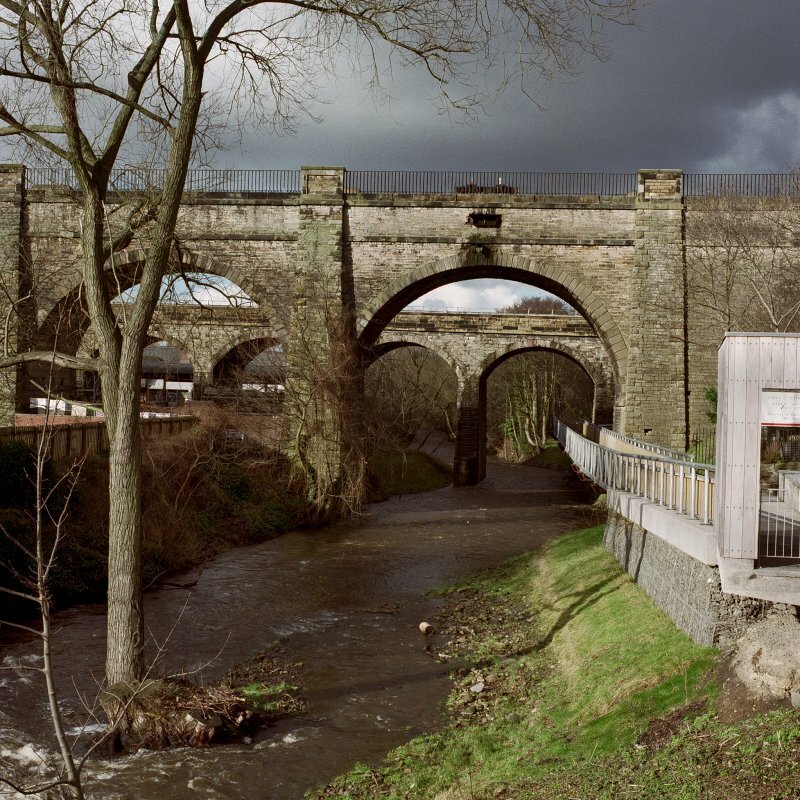 Edinburgh, Craiglockhart, Union Canal, Slateford Viaduct. 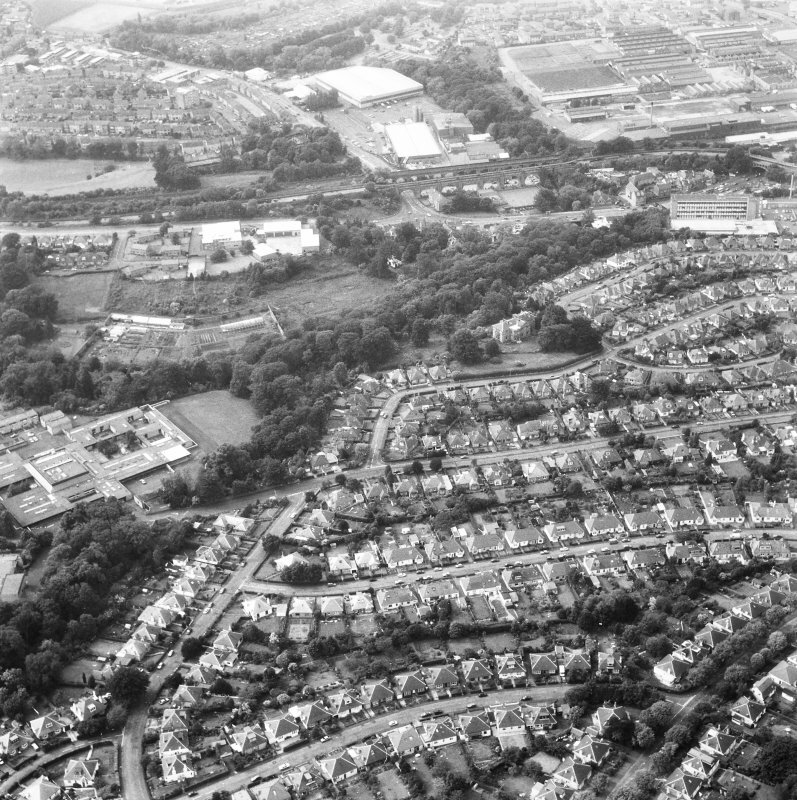 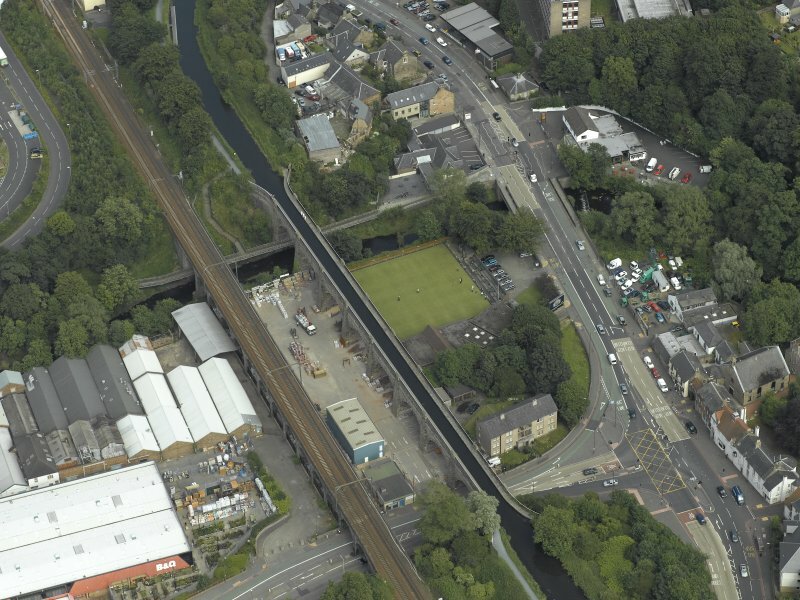 General aerial view showing Union Canal Slateford Aqueduct, Union Canal Aqueduct and Slateford Viaduct. 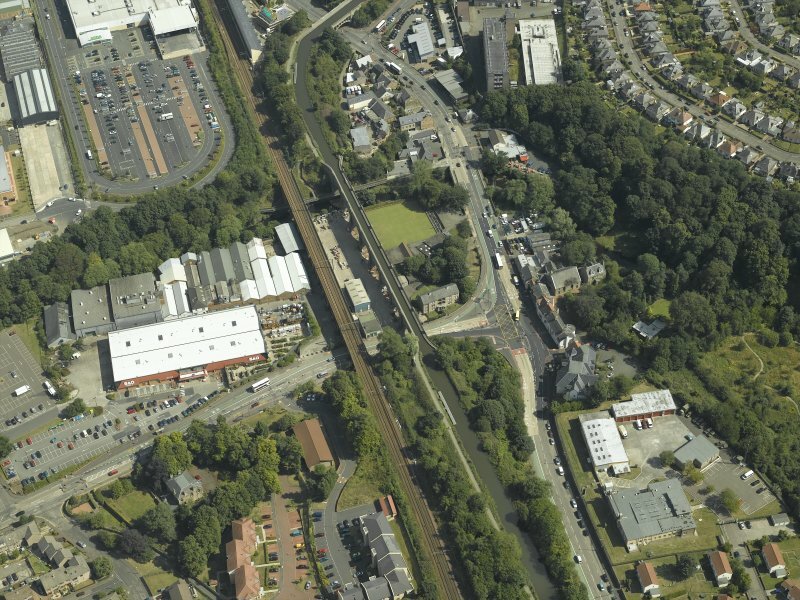 Oblique aerial view centred on the aqueduct and railway viaduct, taken from the ENE. 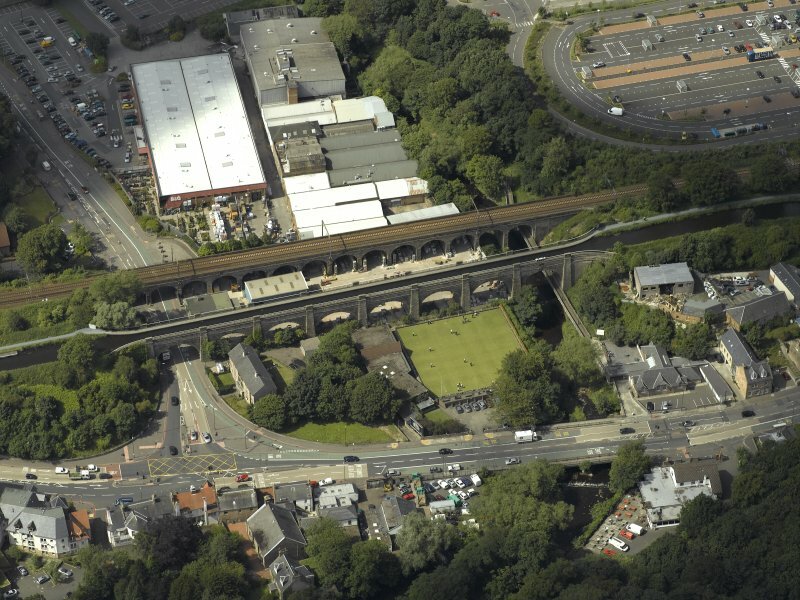 Oblique aerial view centred on the aqueduct and railway viaduct, taken from the SSE. 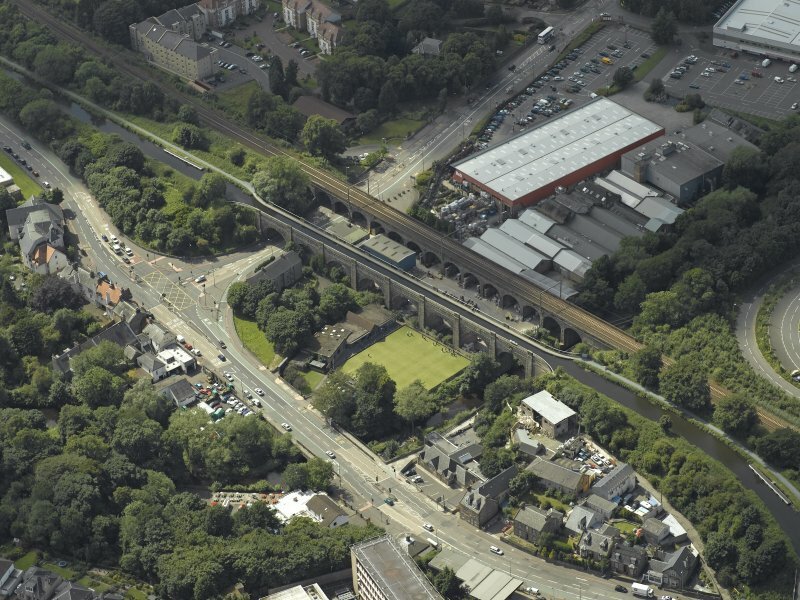 Oblique aerial view centred on the aqueduct and railway viaduct, taken from the SE. 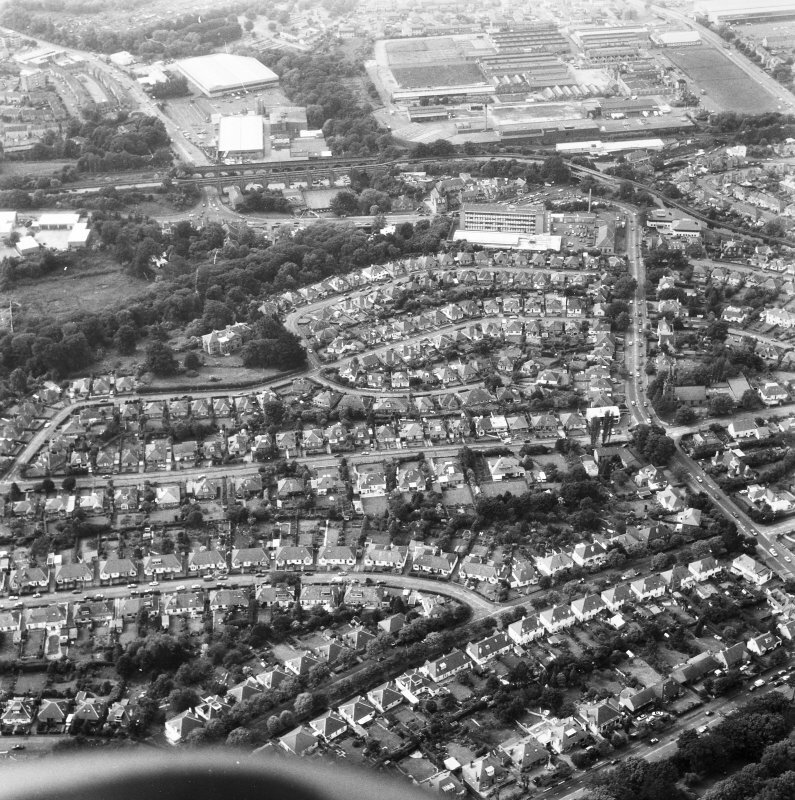 Oblique aerial view centred on the railway viaduct and aqueduct, taken from the NW. 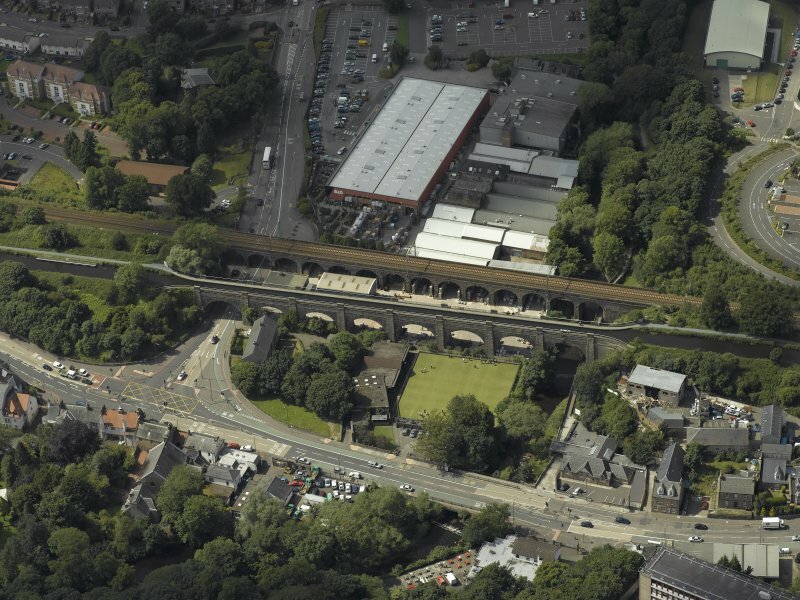 Oblique aerial view centred on the aqueduct and railway viaduct, taken from the NW. 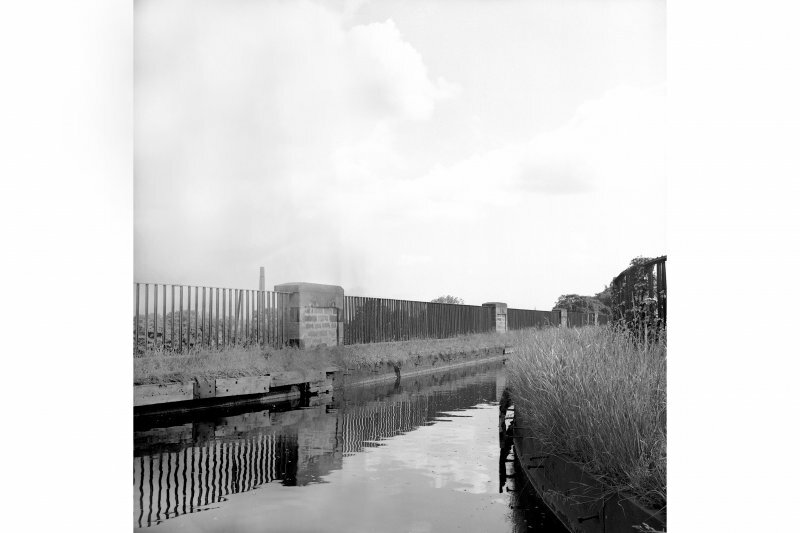 East end of aquaduct, view from south Digital image of E 16446 CN. 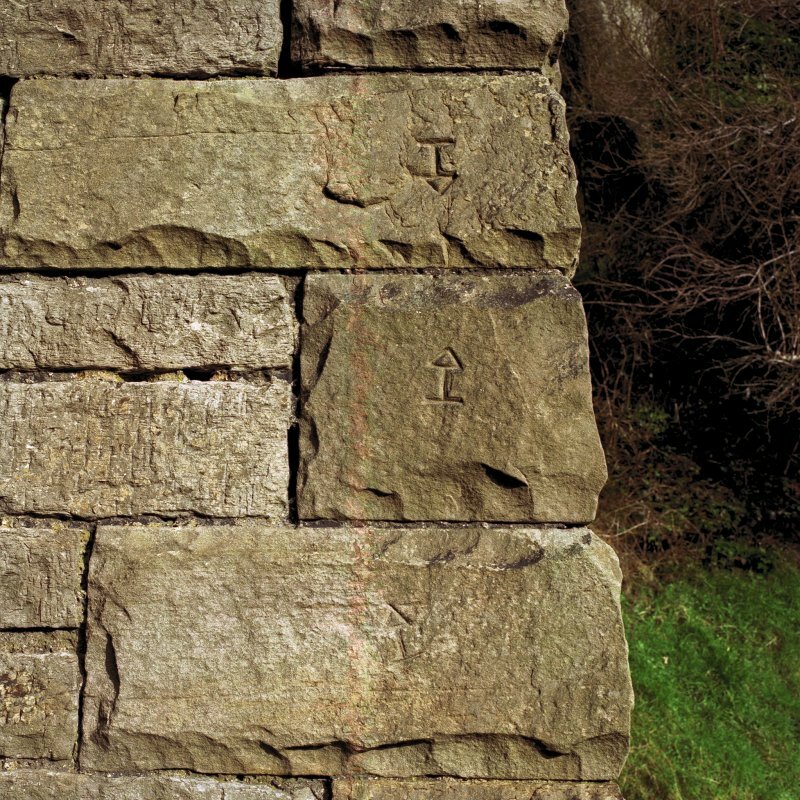 Detail of mason's marks at base of arch. 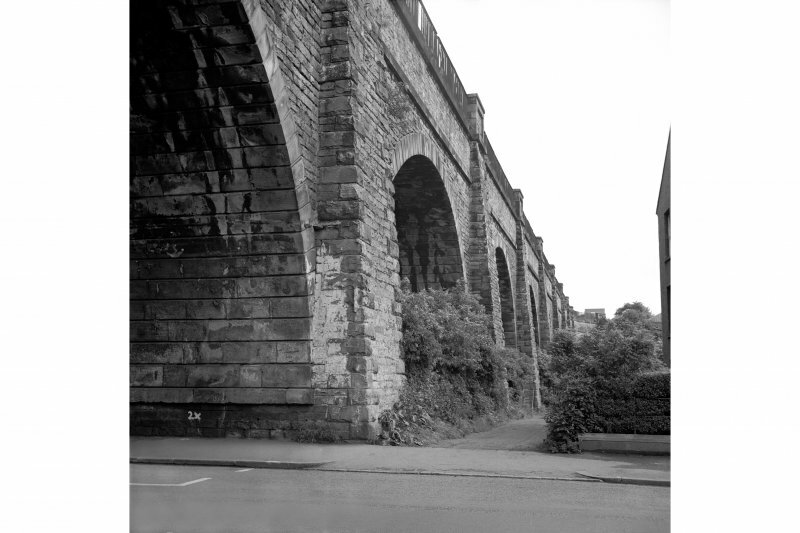 Digital image of E 16452 CN. 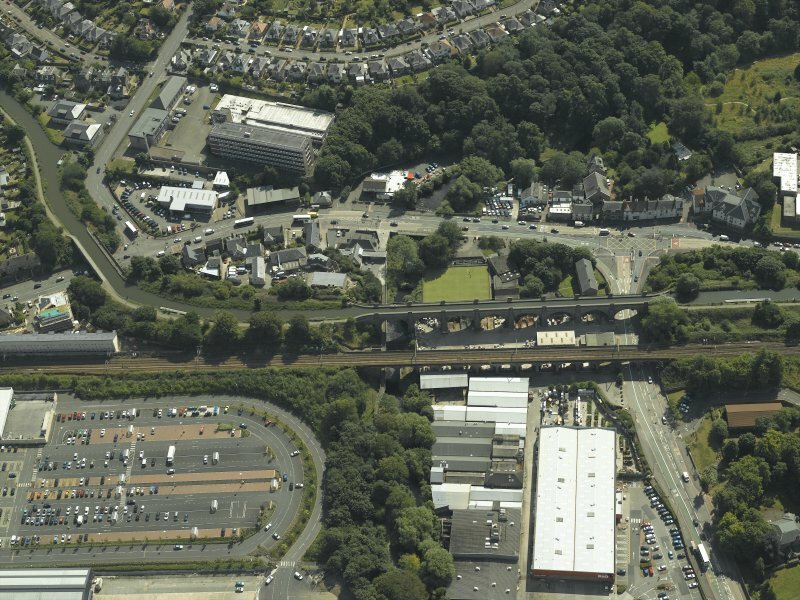 Oblique aerial view centred on the railway viaduct and aqueduct, taken from the WSW. 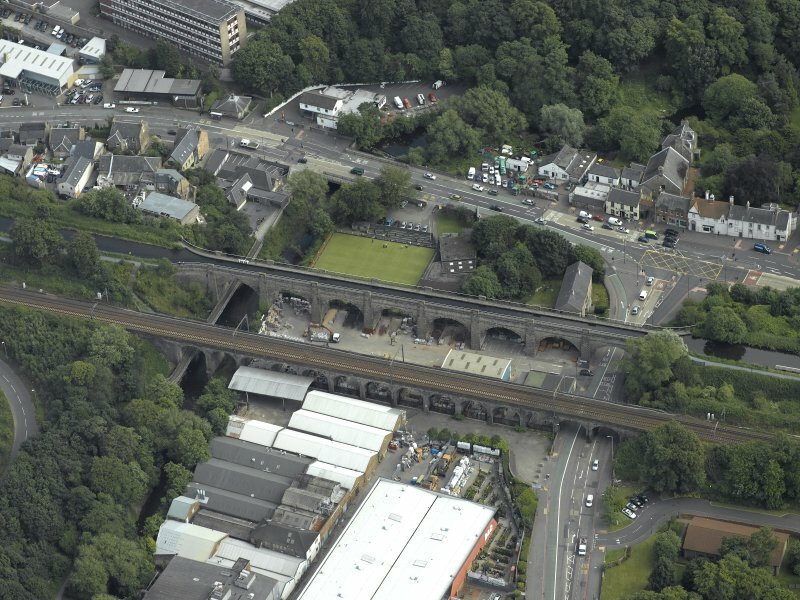 Oblique aerial view centred on the aqueduct and railway viaduct, taken from the SW.
For adjacent and parallel railway viaduct, see NT27SW 100. 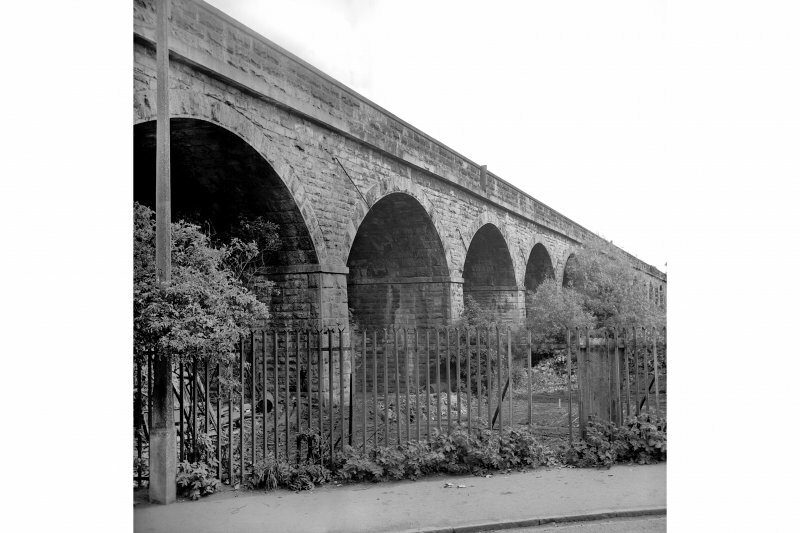 Crossing the Water of Leith, this aqueduct runs parallel to the Lanark Road. 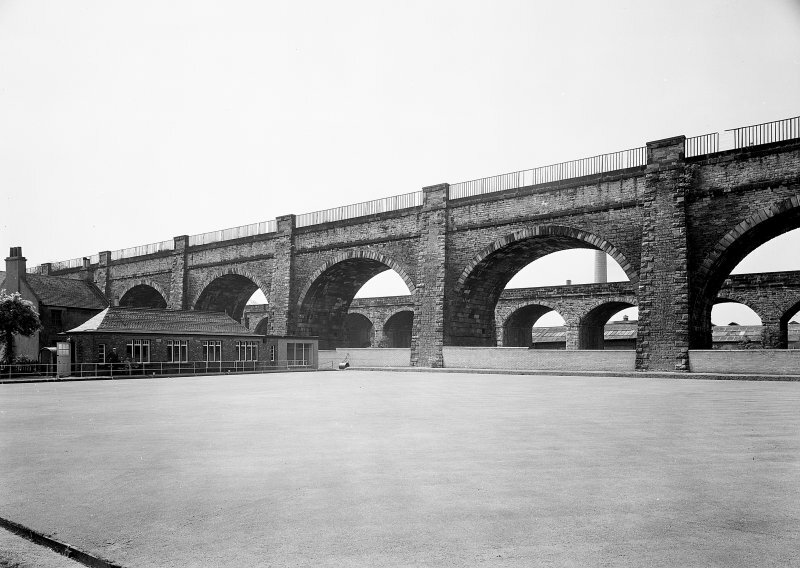 Eight arches with battered piers. 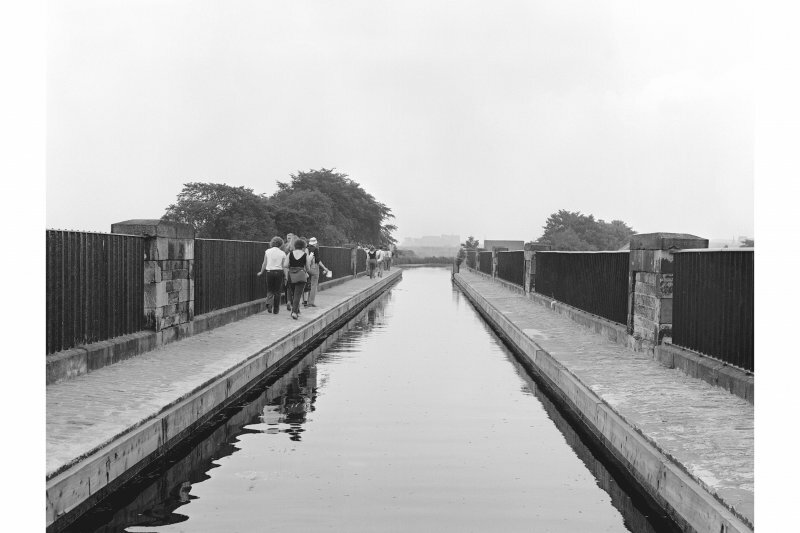 Built 1818-22 and designed by Hugh Baird, but modelled on Thomas Telford's aqueduct at Chirk on the Ellesmere Canal. 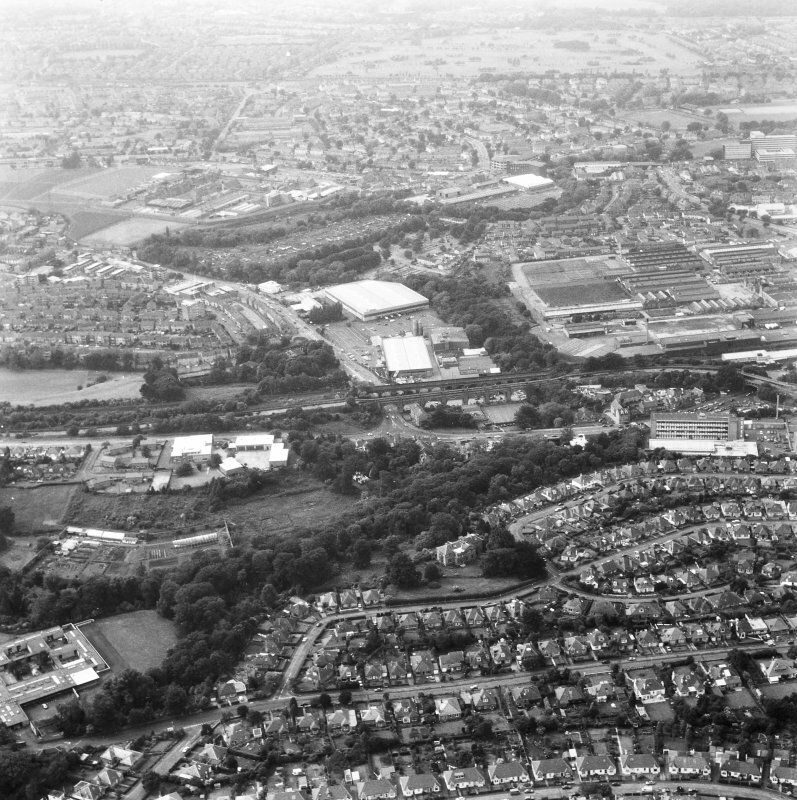 J Lindsay 1968; J Gifford, C McWilliam and D Walker 1984; G Hutton 1993a. 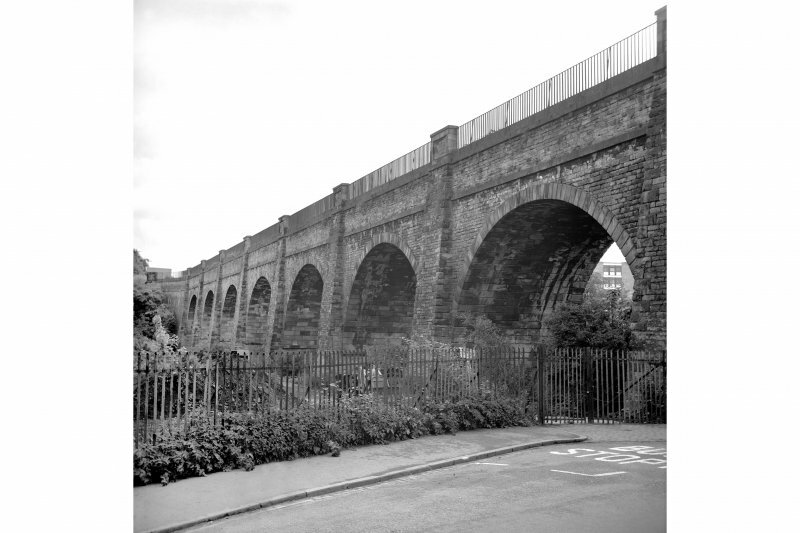 This aqueduct is a magnificent, though simple and elegant, structure, based by its engineer, Baird, on aqueducts on the Ellesmere Canal in England and on consultations with Thomas Telford as regards design. 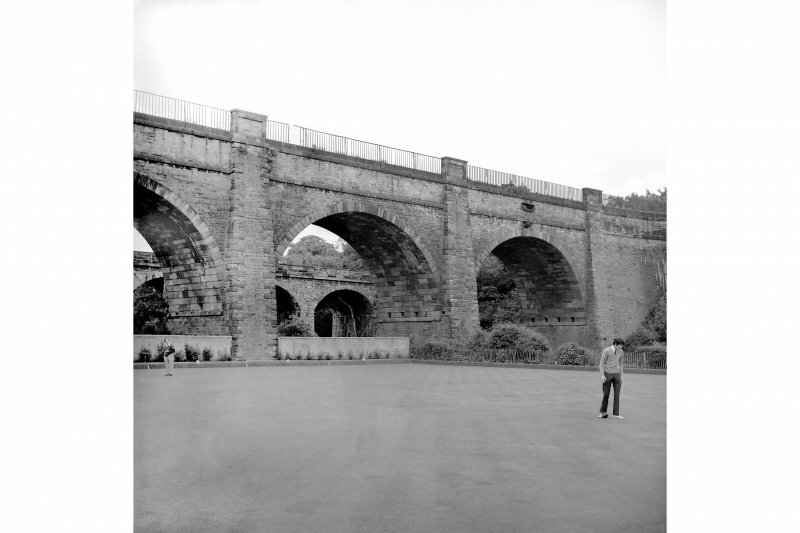 This eight-arched aqueduct is 500 feet long and stands 75 feet above the Water of Leith. 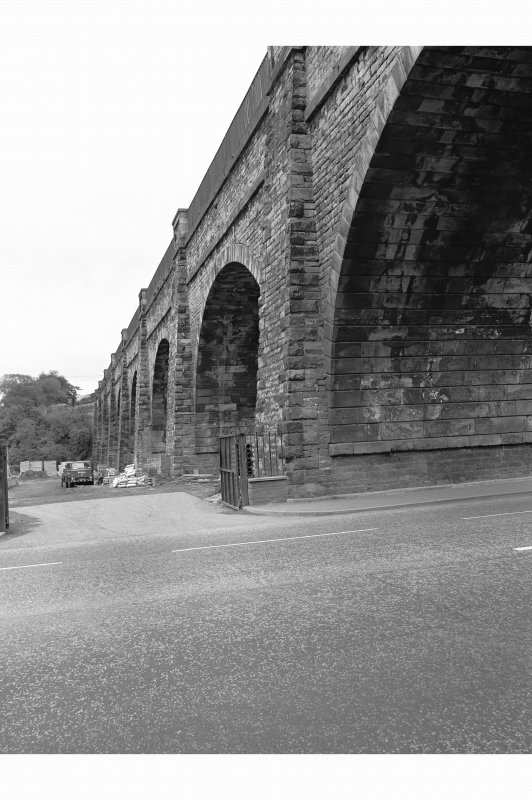 With the waterway passing through an iron trough, it constitutes the most spectacular canal structure insite the city bounds, although it is now somewhat hemmed in to the S by the busy Slateford Road and to the N by a lower arched railway bridge. 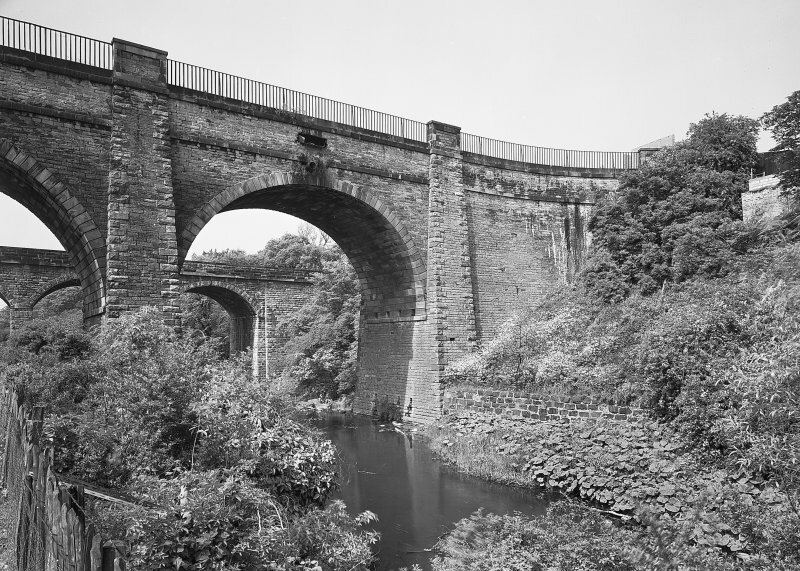 This aqueduct is marked on the 1st edition of the OS 6-inch map (Edinburghshire 1855, sheet 6), as well as on the current edition of the OS 1:10000 map (1988) and on the OS 1:10000 raster map (ND). 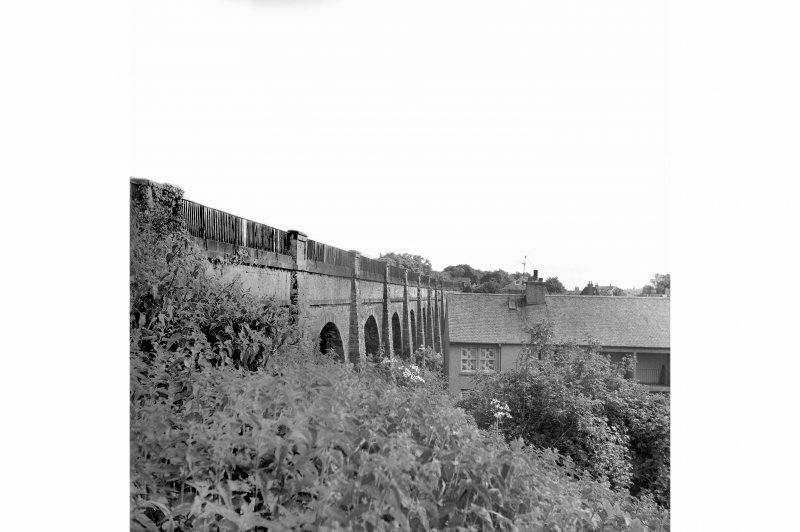 Information from RCAHMS (MD) 1 February 2001. 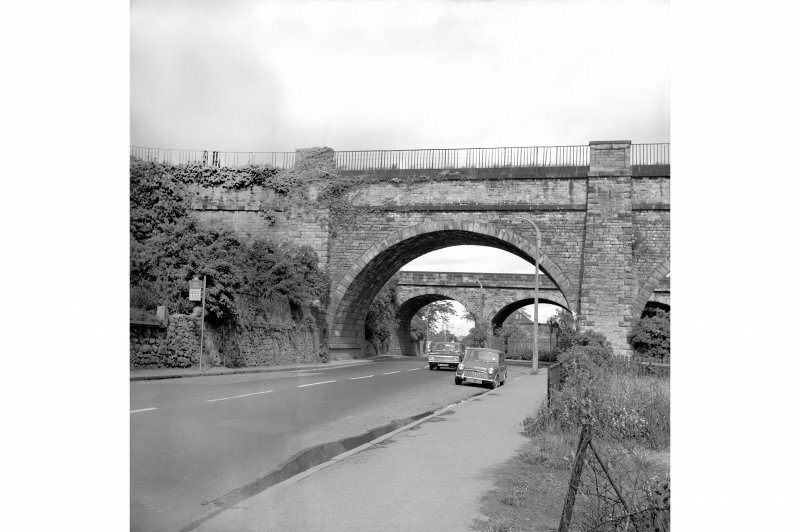 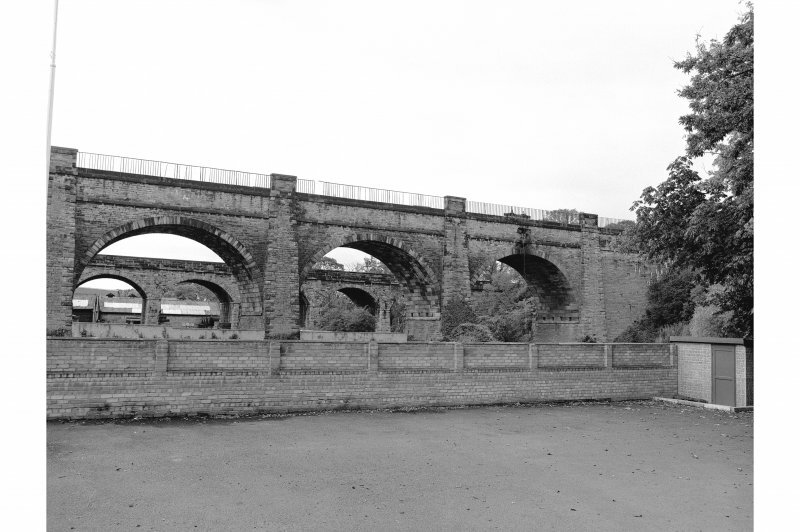 Slateford aqueduct is a magnificent, cast-iron lined structure comprising six 50 ft arch spans. 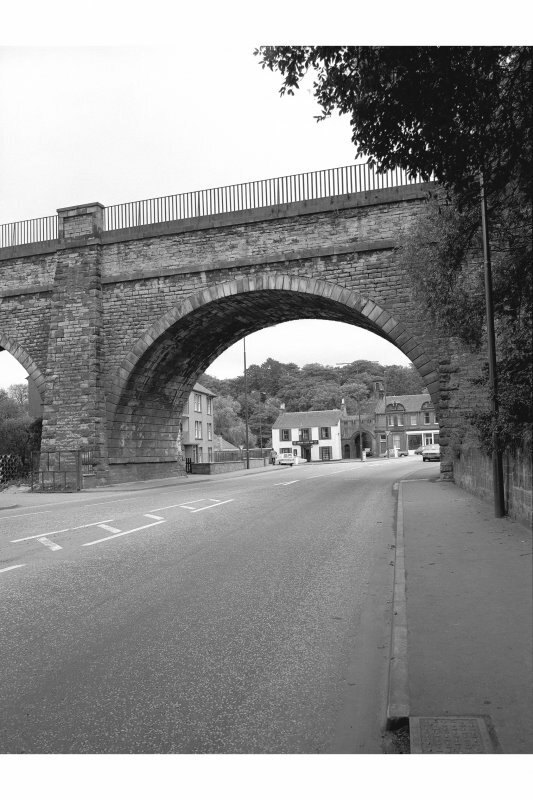 Each span was built to a standardised construction with hollow spandrels in the best Telford tradition. 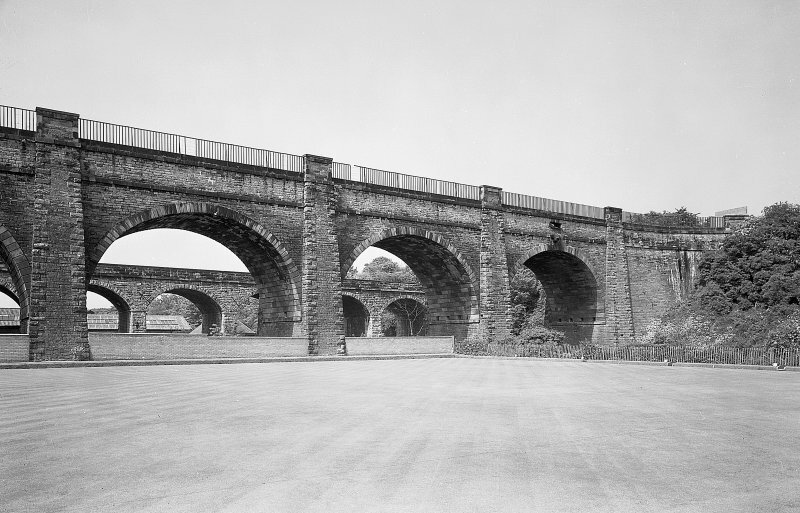 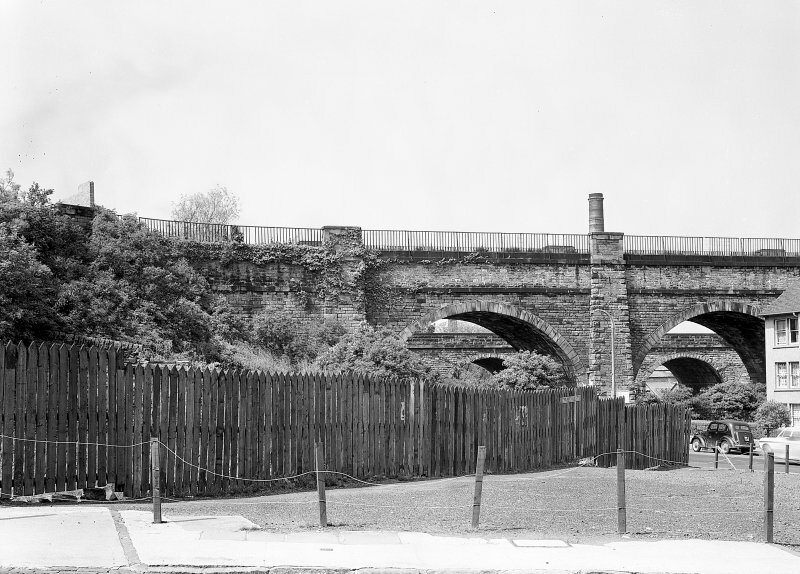 Although Telford was not altogether convinced of the need for masonry spans and spandrels in addition to the iron troughs Slateford, along with the Avon and Almond aqueducts, which are of similar construction but varying numbers of spans, was constructed between 1819–21 by Messrs Craven, Whitaker and Nowell, with Hugh Baird as engineer. 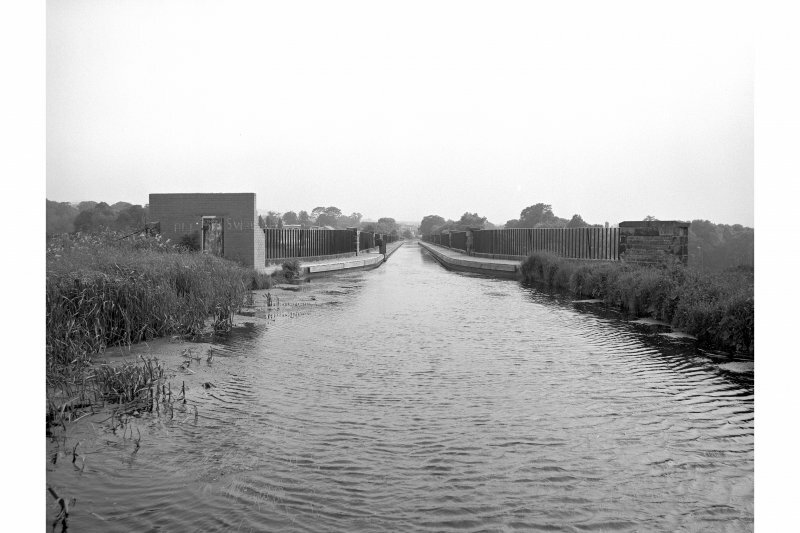 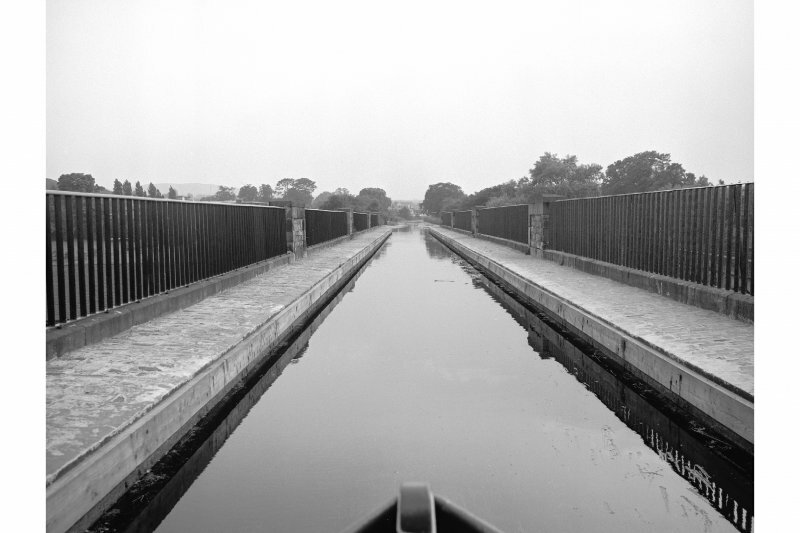 The canal is carried along the structure in a cast-iron trough 7 ft deep and 1312 ft wide. 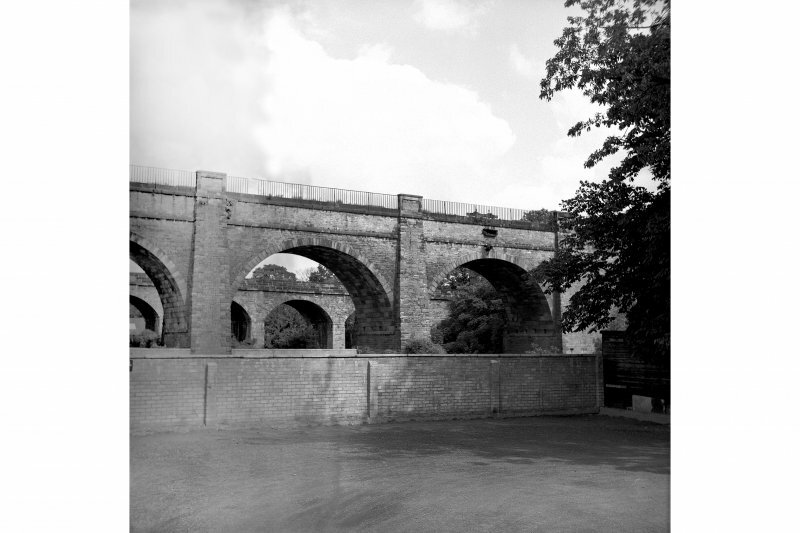 The trough is supported on the arches by a series of longitudinal masonry walls, and its sides are backed by the spandrel masonry of the aqueduct.